If you have any questions about the LADY MOURA information page below please contact us. This motor yacht LADY MOURA is a superyacht of huge proportions. 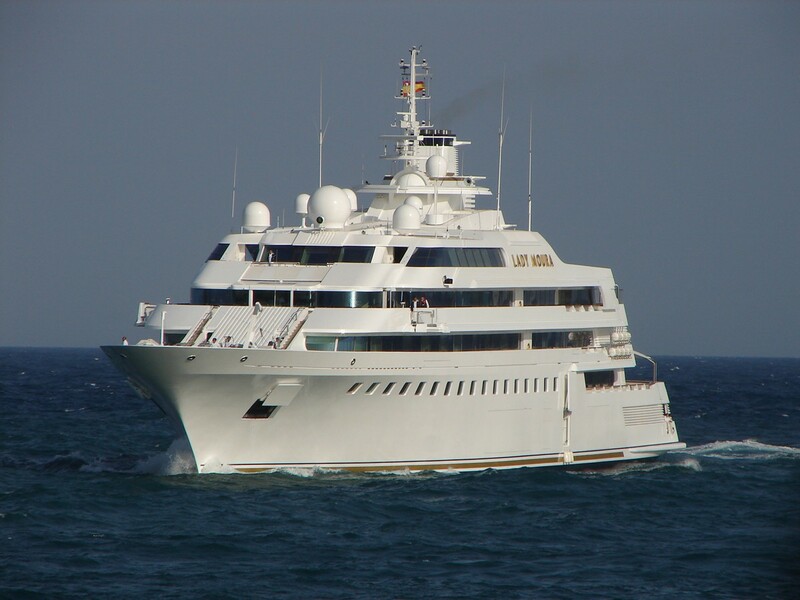 This 105 metre (344 foot) luxury yacht was proudly created at Blohm + Voss Shipyards & Services in 1990. LADY MOURA was previously registered as the project or yacht name 954. Superyacht LADY MOURA is a well designed yacht that can sleep a total of 30 people on board and has a total of 61 crew members. The naval architecture office responsible for her drawings on the yacht is Blohm + Voss and Luigi Sturchio. Luigi Sturchio was the designer which over saw her interior design. 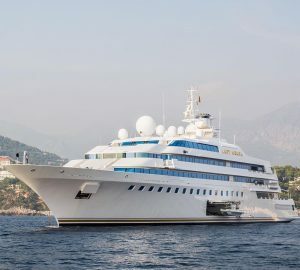 Lady Moura is a private superyacht. 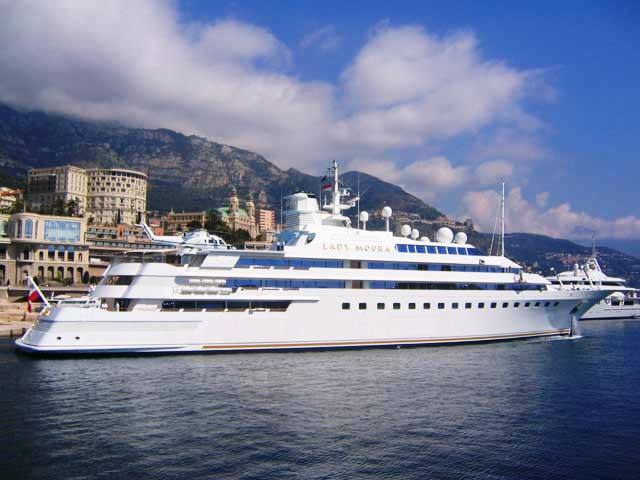 It was pronounced the 11th largest private yacht in the year 2006 in Monte Carlo, Monaco. It is owned by Nasser Al-Rashid, a multi-billionaire businessman in Saudi Arabia. His ex-wife Mouna Ayoub owns Phocea. The yacht's wider design collaboration came from Blohm + Voss and Luigi Sturchio. The technical naval architect firm plans are a work of Blohm + Voss. 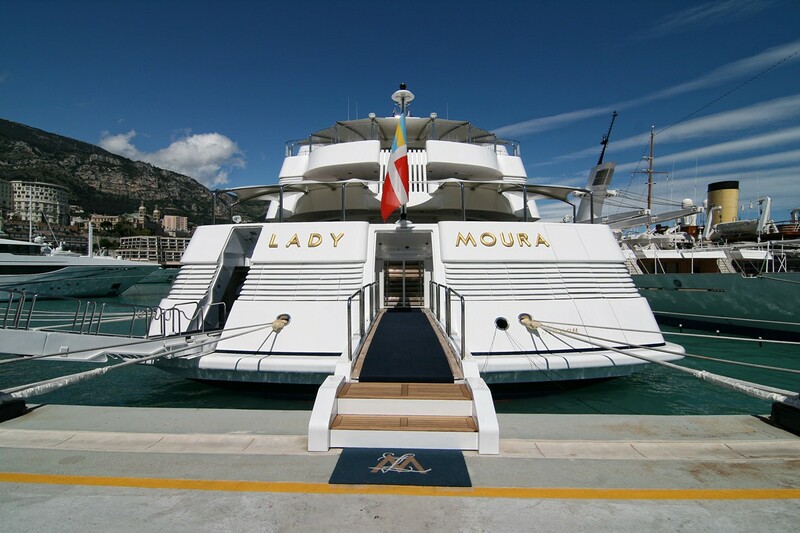 Motor Yacht LADY MOURA received her elegant interior designing from the interior design skills of Luigi Sturchio. In 1990 she was formally launched with triumph in Hamburg and post sea trials and final completion was afterwards passed on to the yacht owner. Blohm + Voss Shipyards & Services completed their new build motor yacht in Germany. A massive proportion is brought about with a widest beam (width) of 19 metres or 62.3 ft. With a 5.4m (17.7ft) draught (maximum depth) she is deep. The material steel was used in the building of the hull of the motor yacht. Her superstructure over the hull is built with the use of steelandaluminium. In 2007 extra refit work and modernisation was additionally finished. The motor yacht posseses two behemothic DEUTZ-MWM diesel engine(s) and can find a invigorating max continuous speed of 22 knots. The engine of the LADY MOURA generates 6868 horse power (or 5120 kilowatts). Her total HP is 13736 HP and her total Kilowatts are 10240. Coupled to the LADY MOURA engines are twin screw propellers. As for the yacht’s stabalisers she uses Blohm + Voss. Concerning bow thrusters she utilises Berg / Stern: Berg. 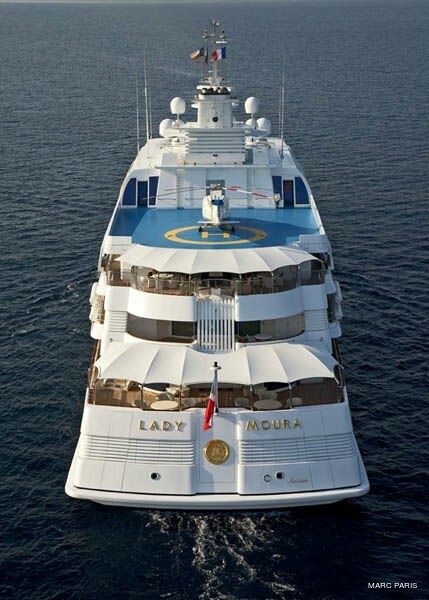 Bestowing bedding for a limit of 30 welcome guests staying on board, the LADY MOURA accommodates everyone luxuriously. The boat utilises approx 61 capable qualified crew to maintain and sail. 104.85 metres / 344 feet. Total engine power output 13736 HP /10240 KW. Antibes. France. Département des Alpes-Maritimes. Provence-Alpes-Côte d'Azur. Around Sept 2009 LADY MOURA cruised Antibes, in France. 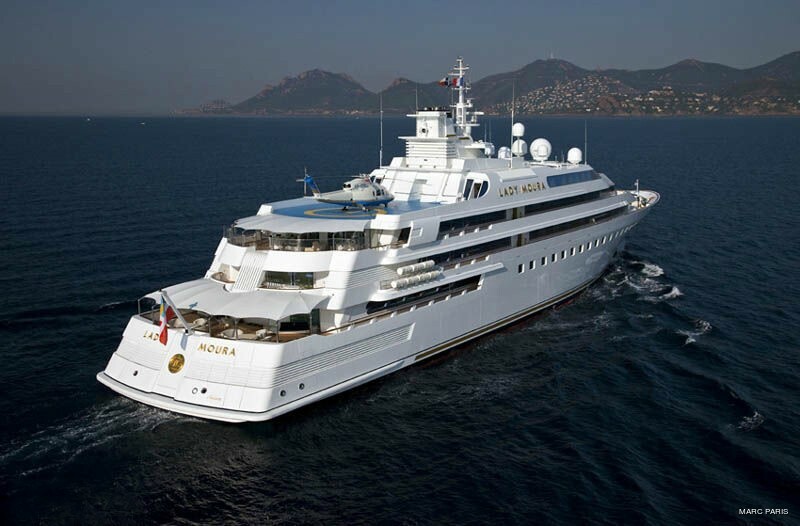 LADY MOURA has navigated the area including Département des Alpes-Maritimes during the month of Sept 2009. LADY MOURA features a teak deck. The luxury yacht LADY MOURA displayed on this page is merely informational and she is not necessarily available for yacht charter or for sale, nor is she represented or marketed in anyway by CharterWorld. This web page and the superyacht information contained herein is not contractual. All yacht specifications and informations are displayed in good faith but CharterWorld does not warrant or assume any legal liability or responsibility for the current accuracy, completeness, validity, or usefulness of any superyacht information and/or images displayed. All boat information is subject to change without prior notice and may not be current.